HomeFootballNewsUnlucky: 13 Premier League clubs hike ticket prices. City cheapest, Arsenal most costly. 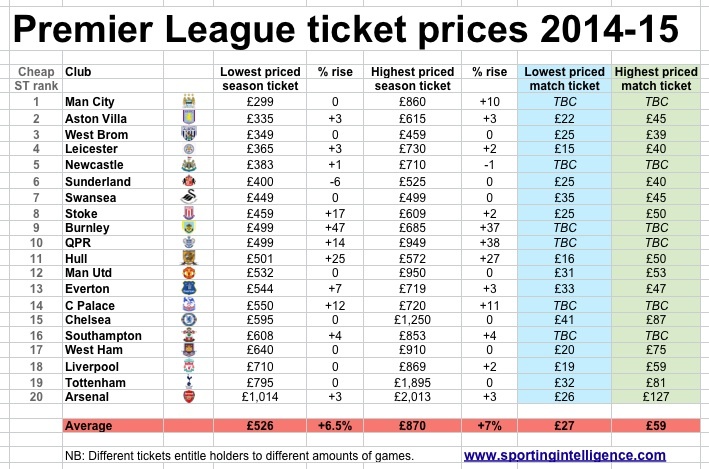 Unlucky: 13 Premier League clubs hike ticket prices. City cheapest, Arsenal most costly. Despite Premier League clubs collecting massively enhanced payments last season, this season and next season from the latest TV deals, worth £5.5billion over three years from 2013-16, the benefits are not reaching fans, with 13 sides raising season ticket prices this season. With clubs looking to maximise revenues to be able to compete in the Premier League within the constraints of FFP, fans are once again paying increased prices. The biggest price hikes have been made by Burnley and QPR, both promoted for the coming season; Burnley have raised the price of their cheapest season ticket prices by a whopping 47%. Substantial rises have also been announced at Stoke and Hull. The average ‘entry level’ (lowest price) adult season ticket in the Premier League is now £526, up 6.5 per cent; while the average top-price season ticket is now £870, up 7 per cent. The table below contains pricing for standard, adult, non-concessionary season tickets, as provided by clubs. A whole range of other prices are or were available in various early bird and concessionary packages. For full details of each club’s pricing policies (which per club fill at least a page), do please feel free to visit their websites. Burnley chief executive Lee Hoos defended the increases with fans able to watch Premier League football this season and because £100 from this year’s season ticket price will go towards the 2015-16 season tickets when fans renew. Hoos said: “We have already announced that the early bird renewal prices will again be frozen this year for the 2015/2016 season when they go on sale. With the Premier League acknowledged as the most lucrative league in the world, only two clubs have lowered prices this season. Football for some fans in the North East has come down after Newcastle and Sunderland announced marginal price cuts. Arsenal announced three per cent price rises in line with inflation, taking their most expensive season ticket prices above the £2,000 mark – the costliest in the league. Arsenal also have the most expensive low cost season ticket, priced at £1,014, which with the exception of Tottenham and Chelsea, is more costly than every other clubs’ most expensive ticket. An Arsenal spokesman explained that priciest match day tickets of £127 were limited to 100 seats. He added: “For next season, the club will once again be operating a categorised ticket policy, with matches at Emirates Stadium being graded A, B or C.
Despite winning the league last term, Manchester City have frozen the cost of their cheapest season tickets at £299 – the cheapest in the Premier League – although the club have announced a 10% rise on the most expensive season tickets at the Etihad to £860. A Football Supporters’ Federation (FSF) spokesman told Sportingintelligence: “Nine out of 10 fans already think they are paying too much for tickets and these figures only back that point of view. “Clubs are swimming in cash and the last media deal was worth £5bn. The huge increase would have been enough for clubs to let every fan in for free and they would have been no worse off. “Top-flight clubs need to think long-term and cut prices. Never mind all the clever PR strategies clubs come out with – nothing would earn goodwill like dropping prices.